The FV4005 Stage II is a Rank IV British tank destroyer with a battle rating of 6.7 (AB/RB/SB). It was introduced in Update 1.67 "Assault". With the turret armour at a laughable 14 mm of armour thickness all around, every tank and nearly every aircraft in the game poses a significant threat. If the enemy tank or aircraft has just one machine gun that fires bullets bigger than .30 caliber, they can easily kill this tank. Tracks and suspension wheels are both 20 mm thick. Spaced armour plates are placed on the side of the Centurion chassis, giving an additional 6 mm of side armour. The rear has a steel rack providing an additional 15 mm of protection. Important note: HESH penetrates better, when hits target at angle, but there is a limit to this effect, due to ricochet chance. In the case of this shell at 30 degrees penetration value is 240 mm, and at 60 degrees penetration value is 256 mm. Ammo racks of the FV4005. 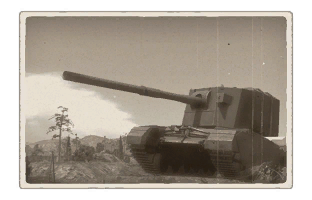 The main ingame use of this tank is elimination of hulldown tanks (similar to T30), super-armoured heavy tanks in general (similar to IS-7), well armoured spg's (similiar to Ho-Ri) and the likes of them. Meanwhile, you still can help your team by hiding around and eliminating reckless rushers in 1 hit, when they aren't looking. Your main goal in between your hunts is to survive and stay hidden, as you only have enough armour to stop 7.64 mm machineguns, and your reloading time is exceptionally long, especially if you lose either of the loaders. Contrary to popular belief, if you aim poorly with FV4005 it does not one shot anything out of existence anyway. You should first get out of your cover (or wait for enemy to get into your firing lines), then take aim at enemy, and only then fire. HESH shell will do the rest for you, if your aim and weakspot suggestion was correct. Weakspots depend on mode you play in. As example, for most Soviet Union tanks the frontal weak spot is the left side of hull (for you - right side). It's also possible to target the back of their turrets in Realistic battle. However, if you fire at back of the turret of IS-2 in arcade mode, it may still survive with just 1 crew member (driver with very high "vitality" level), go into "last stand" mode, turn it's turret and fire back at you. As such, try to aim at places, from which spalling can definitely hit every last crew member. likewise, in arcade mode it's not enough to just eliminate crew in your turret, and your driver is hidden in decently armoured hull. However, if your gun breech got damaged, there is a chance, that the shell in it will also be destroyed, and you won't be able to avenge yourself. Going into sniper duels without preparations, like rangefinding and adjusting the gun beforehand, with this tank is ill advised, as any sniper tank needs significantly less time to aim at you, due to fact that your turret cannot turn freely, your enormous profile and different ammunition type. They also can destroy you in 1 hit as well, by hitting your ammo. The FV4005 is armed with the gigantic 183mm cannon, which is the biggest and most powerful gun in the game. 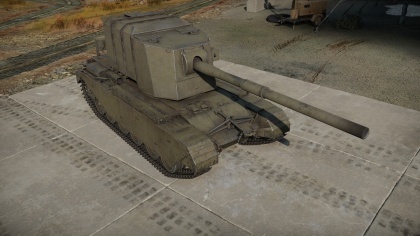 Even a shot from the gigantic 183mm shell that only hits the tracks of an enemy tank can create enough spalling, which travels into the hull of the enemies tank, can leave it severely crippled. 183mm HESH will cause the spalling of enemy armour that is 254 mm thick or less. Which give this gun enough penetrating power to potentially destroy a Maus or E-100 even when firing at the upper glacis plate of either tank. Large gun breech can potentially protect some of the turret crew from incoming fire and shrapnel. A large weak turret with only 14mm of armour all around. Lots of ammo lining the entire turret which can be detonated with little effort. 4/5 crew in turret. An APHE penetration or high calibre HE shell hit will likely one shot the tank. Work started on a 180 mm self-propelled gun in the 1950 by Nuffield Mechanizations & Aero. Designated the FV215B, the plan was to mount the gun onto the Conqueror hull. It was intended for the three trial vehicles to be built from the span of 1951-1955. The project was cancelled in early 1957 with no prototypes produced. During the development phase of the FV215B, another project was done on the Centurion. Labeled the FV4005, it was an attempt to mount the 180 mm on the Centurion hull. The design phase is distinctive in two parts, Stage I and II. Stage I had the gun mounted on an open-topped hull. The gun had a concentric recoil system and an auto-loader. Stage II had the gun encased in a lightly armoured, splinter-proof turret with a conventional recoil system and manual loading. In December 1952, the 180 mm gun was increased into a 183 mm gun mounting. Though a single prototype was made for testing, the project never passed basic feasibility. In August 1957, the project was abandoned as well. The lone prototype is currently stationed outside at Bovington Tank Museum. Skin and Camouflages for the FV4005 Stage II in Warthunder Live. Conway - A vehicle built under a similar principle of a large gun on a Centurion chassis. This page was last edited on 5 April 2019, at 15:42.